Zengobi's Blog: Announcing Curio 7! I'm extremely happy to announce the release of Curio 7! Curio 7 has lots and lots of new features of course, but perhaps even more importantly it's now even easier to use. Oh, we just didn't want plain old tabs. We wanted super flexible über sections. Of course, you can divide your project into any number of sections. That's easy. But with Curio your sections can be hierarchically ordered to as many levels as you want. Color-code them. Rearrange or nest sections with a quick drag-and-drop, and easily drag idea spaces into a section to reorganize your project. The Sections pane has a minimal UI footprint (which was a very high priority), yet it's incredibly powerful and easy to use. 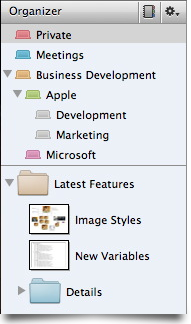 In many situations you may want a simple folder grouping of idea spaces and Curio 7 now offers that as well. Organizer folders can contain one or more idea spaces and even subfolders. By very popular demand, we have added left map, right map, and org chart mind map arrangements. Use the inspector or just right-click on the map to change the arrangement, line style, or branch coloring. I'm very excited about this particular feature. Curio 7 introduces a wonderful new way to manage your styles, templates, and stencils: the Gallery. For example, click the New toolbar button and you are presented with all your personal, bundled, and network idea space styles and templates (templates only if you have Pro). Each item is shown with a full preview. 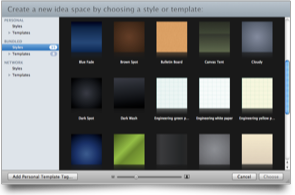 Just double-click a style or template to create a new idea space with that same appearance. Curio 7 shows galleries for projects, idea spaces, collection figures (lists, mind maps, index cards, tables), and general figures. Via a simple right-click you can manage your personal items in the Gallery window, and drag-and-drop bundled or network items to create personal copies that you can customize. And, yes, Curio now comes with dozens of bundled styles, templates, and stencils so you can immediately create beautifully-styled projects right out of the box. Oh, and one more thing: Simply right-click on an idea space background or a figure to apply a new style via the Gallery. Or click the little Gallery button the Inspector Bar to do the same thing. I'm sure you're going to love this new release of Curio! It's more powerful. It's easier to use. It's more robust. And it's faster than ever. Check out the main Curio page and learn more today!